Wheel stripes designed for 17" wheels, easy fitment without the need for a paddock stand. Will fit wheels from 16-18 inches although we can design for any wheel size on request. These decals are cut from a single colour of high quality vinyl although we can reproduce multi colours on request. Please choose your colour option from the option box. If you would like this decal for another bike, please contact us for a free quotation. 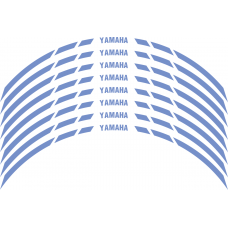 Yamaha Tuning Forks logo in your choice of colour and size, this decal has no background.Small : 50m..
Yamaha Fairing replica pack in your choice of colour, decals have no background.Pack includes:Yamaha..
Aprilia Factory V4 Tricalore logo in your choice of colour and size, this decal has no background an..
Frame decals for the 2017 Aprilia RSV4 and Tuono V4.2 full decals (1 left, 1 right, each containing ..